With all the hustle and bustle of the holiday season, it is easy to forget how wonderful simplicity can be. Meet Apolinar Sanchez and her two sons, Cristobal and Mario. For the Sanchez family, their livelihood depends on agriculture. All year round, year after year, the Sanchez clan plants, tends, and harvests crops in their family fields. They produce the staple crops of Nicaragua, such as beans and corn. Behind them in this photo, you can see a pile of dried corn. Their task of the day is to manually husk and shuck six bags before sun down. This task may seem tedious to some but to the Sanchez family it is a job they take pride in, and they really enjoy doing it together. 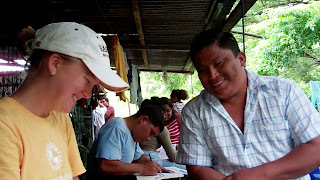 Apolinar's family lives in a community called Piedras Coloradas. The center of their community has an elementary school and a church, but not a single market or stores. A stream runs behind the Sanchez home. This is their only source of water -- for drinking, for cooking, and for bathing. A bed with no mattress stands in the corner of their home. I did not ask where all seven of the family members sleep. As I quickly tried to take all of this in, Apolinar's two grandchildren came running home from school and jumped onto her lap. A smile stretching from ear to ear appeared on her face, and she told me (in Spanish), "This land has been in my family for decades. Although we do not have much, we have our harvest and each other. What else could I ask for?" Apolinar Sanchez is part of our first expansion group in Piedras Coloradas, Nicaragua (about 2 hours by bus from the nearest city, Matagalpa). Her lending group will begin receiving loans in March 2012. If you would like to help fund loans for this community, please visit our donation page and indicate in the special instructions "Donation to Piedras Coloradas." As you may have noticed, things have been pretty quiet on this blog lately. That's because we've been busy working hard on two big projects. The first project is our summer speaking tour, where we're travelling around the U.S. giving talks about poverty, microlending, and how PHPG is using microlending to eradicate poverty in Nicaragua. On this tour, we are asking groups to sponsor loans to help us reach the goal of 100 loans funded by October 17 - World Poverty Day. The other big thing we're working on is an expansion of our microlending programs to a new region of Nicaragua, called Matagalpa. We look forward to sharing our progress with you sometime in Fall. As always, thank you so much for your support. If you think of a group that might be interested in hearing about our work or sponsoring a loan, please send me an email at alex@phpgmicrolending.org. Estamos de vuelta en Nicaragua! Isabel and I are back in Nicaragua! Having arrived here about two weeks ago, this blog is a bit overdue, but after about 24 hours of travel we are once again South of the border. We left Burlington the day after our Valentine's Day event; got on a bus from Burlington to Boston at 2 a.m. and then hopped on a plane from Boston to Miami, which led us to our final flight into Nicaragua. When all was said in done we got in at 2am on the 15th. It feels nice to be in a warm climate again! I hear its snowing in VT?! Upon arrival we got right down to business, having been gone for almost three months there are quite a few things to follow up with. Isabel's first objective was to go out and meet with the participating communities to let them know when our upcoming check-in meetings would be. On March 1st we had our first formal community meetings in the Island Community and with our two loan groups in Avelardo Enrique, both of which are located near Granada. Everyone was excited to see us again and were full of questions about our travels in the States. We were very pleased to have three recipients repay their loans in entirety this month, which is very encouraging to know that the process we have developed and you are supporting is working! About a week following our arrival Paul and Janel Gamm came down to visit. We love visitors! Paul is currently a Director on PHPG's Board. We were able to show them around one of our communities, Avelardo Enrique and the activities surrounding those particular loans. 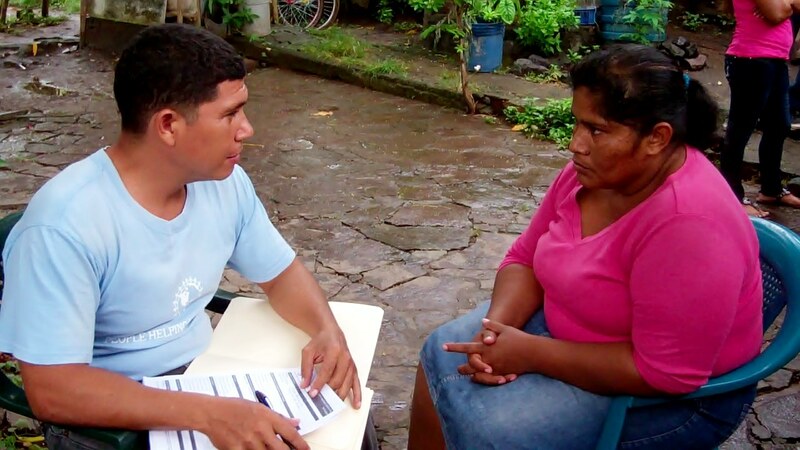 Now that we are settled back in for the next couple of months - meetings are lining up to collect new loan requests, conduct interviews around these new requests and inform several communities when they are going to receive their loans. Because of the success we had in fund-raising over the holidays we will be able to award about 30 new loans next week alone! That's all the news for now, signing off from Nicaragua.